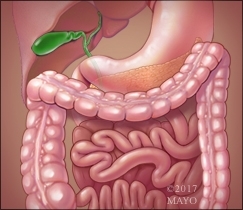 The esophagus is the tube through which food and liquid pass into the stomach.The walls of the esophagus propel food to the stomach by rhythmic waves of muscular contractions called peristalsis.The lower esophageal sphincter (or LES) is a muscle that separates the esophagus from the stomach. It acts like a valve that normally stays tightly closed to prevent contents in the stomach from backing up into the esophagus. When we swallow, the LES opens up to allow the food we swallow to enter the stomach.